It’s commonplace for organisations to regularly evaluate and report on their activities and processes to ensure that they are working well. Evaluation allows companies to benchmark themselves against competitors, identify strengths and weaknesses, expose gaps and pursue new opportunities. So how well do science communicators fare when it comes to this kind of analysis? Launched earlier this year, the Sciencengage website is a tool available to science communication professionals to benchmark their work with others as well as increase awareness about the variety of science communication and engagement activities in Australia. It’s a dynamic public resource available for everyone, including researchers interested in the diversity of activities that characterise Australia’s voice in the international conversation on science engagement. An Inspiring Australia initiative created by Econnect Communication in Brisbane and currently managed by Australian Science Communicators, the site is one of the programs arising from recommendations by an Expert Working Group looking at how we can create an evidence base to science communication. While most science communication professionals appreciate the importance of evaluation, the idea of benchmarking progress against others to demonstrate performance is relatively new. With around 400 records since it was launched ten months ago, Sciencengage needs more participation for it to become an effective national benchmarking tool that can showcase ‘best practice’ programs. President of Australian Science Communicators, Professor Joan Leach from the University of Queensland, is urging science communicators to take the time to add their programs to the Sciencengage database. In other sectors, companies routinely make evaluation results widely available to the public to demonstrate best practice and provide evidence that allows some to claim superior performance. There are many indices that measure and evaluate sector performance and compare participants seeking to achieve best practice in certain areas. For example, in the area of corporate responsibility, a number of published surveys measuring a company’s impact across of the environment, society and governance, including at a global level, are published annually. Depending on the objectives of your outreach programs, you may be meeting targets, but how do your programs stack up against similar initiatives that seek to achieve the same kinds of objectives? Are you really demonstrating best practice? Without actually looking around at what others are doing, can you be confident that your programs are relevant, in step with current trends and making the best use of technologies, not to mention reaching a wide range of audiences? Where might you be able to do better? Even if your targets are being met, are there emerging areas that you could explore? Your university’s enrolement numbers may be strong, but by collaborating with other organisations and entering into new partnerships, you could be taking your programs to new audiences, adding value to other organisations and extending your brand. By being transparent, reporting on your progress, emulating elements of innovative programs, adopting what works and winding up programs that are ineffective, you’ll be staking a leadership role in the Australian science communication landscape. Joan added that we have a lot to be proud of in the Australian science community. 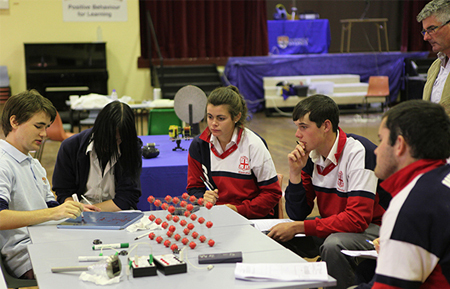 Another initiative currently underway that seeks to document the number and effectiveness of school outreach programs is the STEM outreach:getting it right survey designed by Australian universities. It’s a project funded by the Office of Learning and Teaching, Federation University, Deakin University, Griffith University and QUT. Project Leader Associate Professor Jennifer Mosse from Federation University in Victoria’s Gippsland region says that particularly given the current climate where funding is becoming less secure, it is critical for science communicators to mindful about how their programs are evaluated. As current funding trends are skewed towards big picture projects that generate large metrics, Jennifer warns that there’s a risk that enrichment programs may not reach teachers and students in rural communities. the characteristics of effective outreach programs. Jennifer said that whereas city universities may design outreach programs around gifted and talented students with the view to boosting recruitment numbers, in rural communities, science outreach efforts are more likely to be based on aspirations – often to simply complete high school and them perhaps aspire to tertiary education. “It’s capacity building rather talent scouting,” she explained. The project ultimately hopes to support regional secondary school teachers to teach mathematics and science subjects more effectively and to inspire regional secondary school students to pursue STEM-related university courses. All universities are encouraged to consider participating in the STEM outreach:getting it right online survey: it takes just 15 minutes to complete and can be accessed here.